How to Install Aerial Fiber Optic Cables? When you walk on the street, have you noticed at the fiber cables hanging on the poles overhead? These cables are commonly called as aerial fiber cables, which are widely used for outside plant (OSP) installation on poles. Aerial fiber cables are designed to accommodate the severe environment preventing the destruction of the nature and man-made damage or theft. There are also different types of aerial fiber optic cables. This article will describe the common installation ways and things to notice during installation. 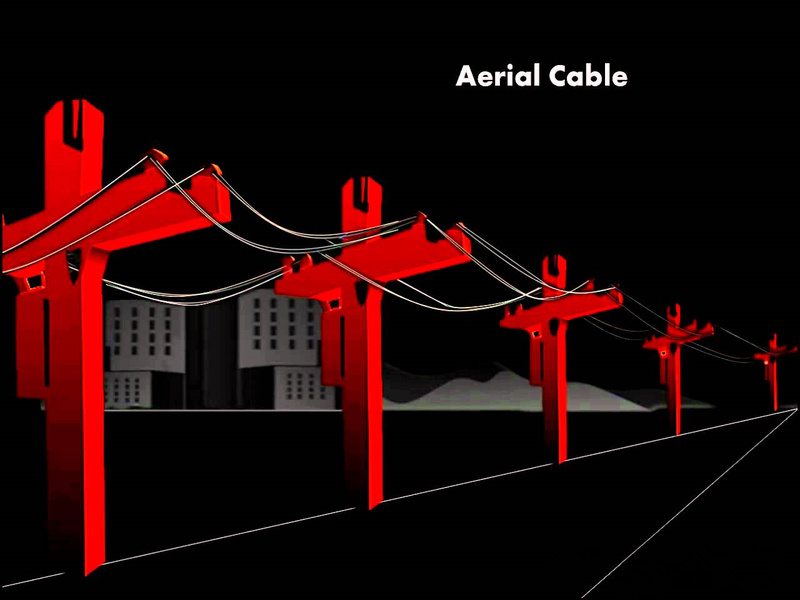 Aerial fiber optic cables can be classified into the catenary wire style and the self-supporting style according to different installing ways. The catenary wire style refers to the general outdoor loose tube cables which can be lashed into a messenger. The self-supporting style refers to the ADSS (all-dielectric self-supporting) cables. They are made to support their own weight and environmental conditions such as wind and ice. Figure 8 self-supporting aerial fiber optic cables are the common ADSS cables designed for easy and economical one-step installation over long haul network communication. Point 1, before the aerial cable installations, making a proper plan is very necessary. All the parties including utilities, street department and so on should be present in the cable route survey. And the plan should be approved by all the parties. Point 2, sufficient clearances must be maintained between fiber optic cables and electrical power cables on joint-use poles. 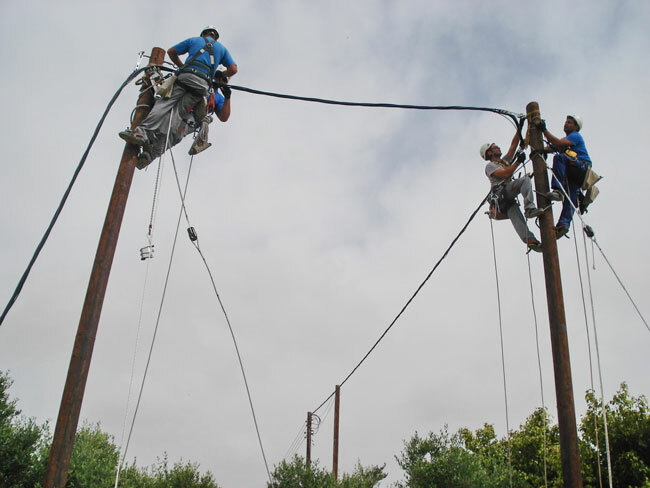 Point 3, existing dead-end pole must be evaluated to see whether they can withstand the stresses during aerial cable installation. You have to evaluate whether temporary guying is needed in order to relieve the temporary unbalanced loading during cable installation. Point 4, splice locations are usually selected during the cable route survey. They are chosen to allow for the longest possible continuous cable spans and a minimum number of splices. They should be easily accessible to a splicing vehicle. Point 5, remember aerial installation should never be done in wet conditions. And make sure all personnel are properly trained for pole line work. According to different aerial cable types, there are generally two installation ways. First is to lash a fiber optic cable to a steel messenger. A steel messenger is first installed between the poles. Then a cable reel trailer and truck are used to pull the cable along the messenger. A cable guide and cable lasher are used to wrap around both the messenger and the fiber cable to secure the fiber cable to the messenger. Following the cable lasher is an aerial bucket truck which makes necessary adjustments. At each pole, the fiber optic cable forms an expansion loop to allow for expansion of the messenger. The expansion loop’s sizes have both a length and a depth, and its length should be larger than twice its depth. The fiber cable should also maintain its minimum bending radius at all times. Another way is the direct installation of self-supporting figure 8 aerial cables. It greatly simplifies the task of placing fiber optic cables onto an aerial plant. The self-supporting figure 8 cable incorporates both a steel messenger and the fiber cable into a single jacket of figure 8 cross section. The combination of strand and optical fiber into a single cable allows rapid one-step installation and results in a more durable aerial plant. Tip 1, ensure that the tools and equipment used for the cable installation are in proper working order. Improperly functioning equipment may damage cables or cause injury to personnel. Tip 2, be careful when working near electrical hazards if electric lines are passing through or near the right-of-way where installation is being performed. Tip 3, before pulling cable directly from a figure 8 configuration, make sure that the area inside the loop of the cable is clear of personnel and equipment. Failure to do so may result in injury to the personnel or damage to the cable. Installing cables is not an easy thing, especially for aerial cable installations. Extra concentration and patience are needed during the installation. The actual situation is usually much more complex than we talked right here. You need to adjust your plans according to real conditions.